The best way to reach this Bermuda destination is by kayak: a 20 minute paddle takes visitors to Church Bay, featuring some of the world’s rarest pink sand. Bookended by jagged limestone cliffs, the beach at Church Bay is a secluded escape with calm, clear-blue water and coral reefs that provide an incredible snorkeling experience. 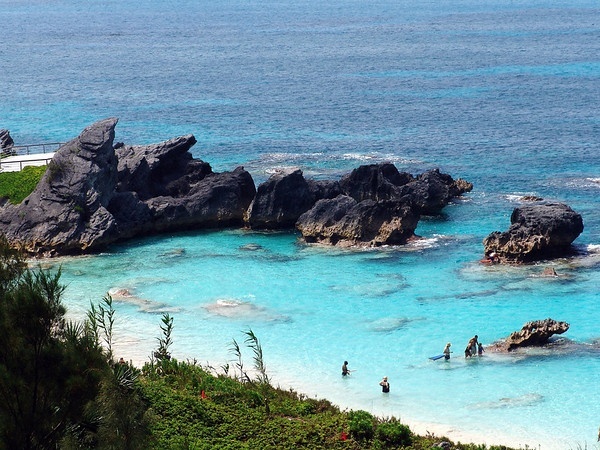 It’s a hidden gem in Bermuda! A two-hour drive from Los Angeles, the San Bernardino National Forest is home to one of California’s hidden treasures – Deep Creek Hot Springs. To get there, water seekers will have to brave the heat on a two-and-a-half mile hike through the Mojave Desert. Deep Creek features a cluster of both hot and cold pools where swimmers can cool off in 60-degree pools or soak in the 10-foot-wide, 3-foot-deep hot springs that can reach temperatures of 105 degrees. Those seeking a little more adventure can try cliff diving or slacklining. Florida is home to the largest concentration of freshwater springs on earth and Ichetucknee Springs State Park, 35 miles from Gainesville, contains one of the area’s crowns jewels – the Blue Hole. After kayaking one mile to the secret spot, swimmers can take a dive into the pristine, intensely blue, spring-fed pool where water temperatures sit at 72 degrees year-round. Keep swimming and you’ll see the 6-foot-deep, sandy, grass-covered bottom open up to a 12-foot-wide, 35-foot-deep chamber – a limestone shaft where the blue hue intensifies as a spring pumps out 26,000 gallons of water per minute. Just 20 minutes outside of Honolulu on the Hawaiian island of Oahu, a forest path leads to a secret cascade with wild detours. 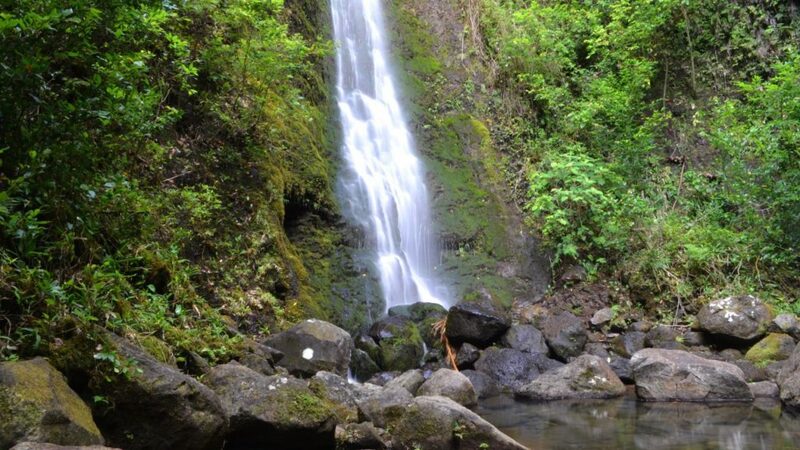 Adventure seekers will find their first thrill just five minutes into the hike – Kapena Falls, a waterfall with a 40-foot cliff jump. Deeper into the jungle, one of Hawaii’s most historic destinations awaits – the ruins of King Kamehameha III’s summer palace from 1845, now sitting forgotten in the forest. After traversing challenging terrain with wet conditions, hikers are greeted by Lulumahu Falls – a 50-foot, rainfall-fed cascade with 72-degree water to plunge into. 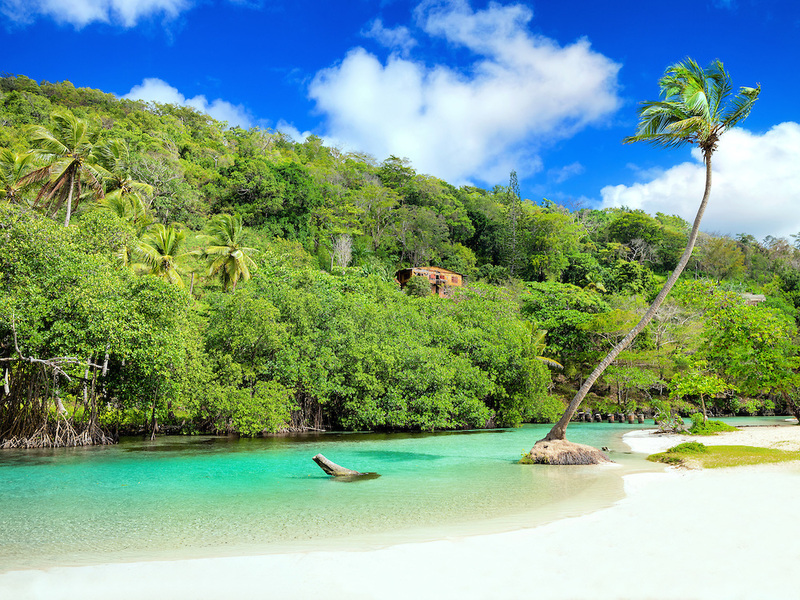 While in St. Vincent and the Grenadines, head to the area’s best kept secret – the oceanfront swimming hole known as Owia Salt Pond. 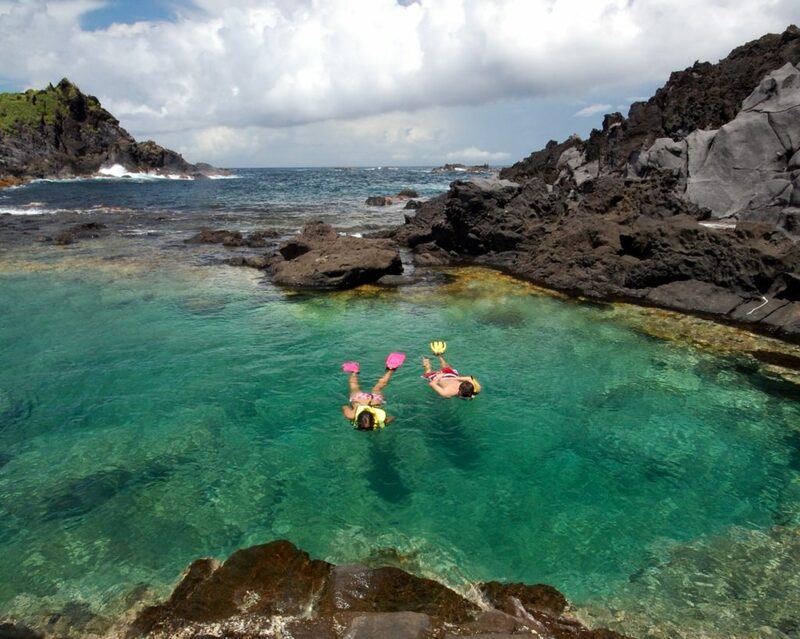 The path to this protected pool can be tricky but a local guide can help direct visitors to one of the earth’s most stunning and secluded swimming holes – a 100-foot-wide lava basin at the edge of the Atlantic Ocean. The main pool is hidden by an expanse of volcanic rocks, but 79-degree, calm, blue seawater awaits those who find it. Water depths range from 6 to 12 feet and the pool’s shape actually changes based on the tide – it can even be wide enough for paddle boarding at times. When the tide comes in it’s time to head out, but a five minute walk to a flowing freshwater steam is the perfect way to rinse off an epic saltwater swim. On this hidden stretch of land, you’re more likely to find donkeys than tourists – Playa Rincon in the Dominican Republicis a secret beach few visitors get to see. An hour’s drive, or 15 minute boat ride, from the tiny town of Las Galeras, visitors are treated to a wild and pristine beach with two miles of white sand and 80-degree water surrounded by the towering 2,000-foot-tall cliffs of Capo Cabrón. But there’s more to explore at this beach. Head to the far east end where a crystal clear, freshwater river emerges from the jungle, flowing around the mangrove trees like an enchanted forest. A nearby food stand caters to local fishermen. Poco Azul in Brazil – a 65-foot-deep lagoon with some of the clearest blue water on earth. Chapada Diamantina National Park sits 260 miles inland from the Brazilian city of Salvador, and features hundreds of miles of towering rock formations and underground caves. The most mysterious of these caves is Poco Azul, which houses some of the clearest blue water on earth. Visitors are required to take a shower before swimming so as not to contaminate the water with oils and lotions. After hiking down steep trail heads through the jungle, visitors enter the cavern – a 65-foot-deep lagoon with water so stunningly transparent that the underwater landscapes emerge as clear as day. Scientists have found many fossils in this ancient cave, including an extinct 20-foot-tall ground sloth. It’s a serene and secluded swimming experience like no other! 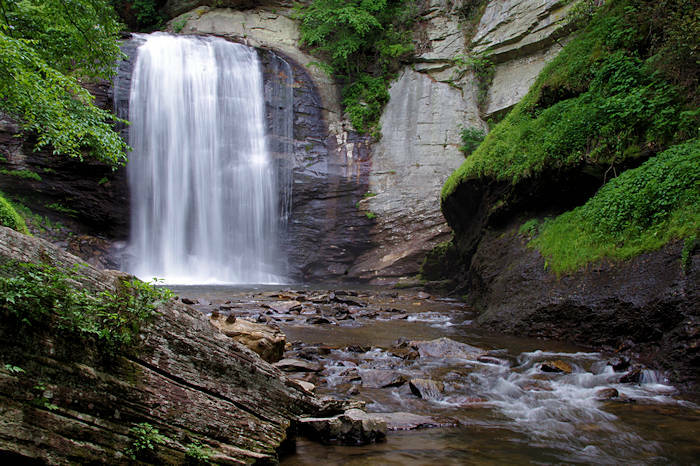 North Carolina’s Nantahala National Forest, 30 miles southwest of Asheville, is a year-round, peaceful getaway and home to Skinny Dip Falls. The trailhead to the half mile hike is tucked away, but once water seekers make their way through the woods a variety of old trees help serve as a navigation system to the water. 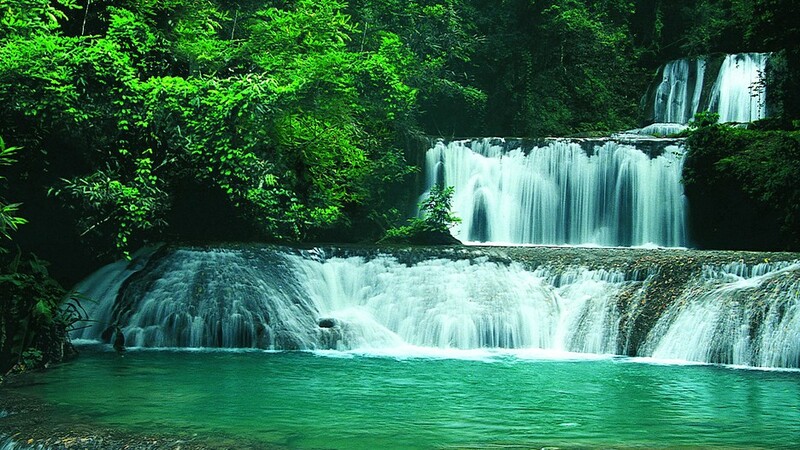 The waterfalls are a three-tiered cascade with a 30-foot drop and a skinny 8-foot-wide pool at the base. Varying rock heights provide an assortment of platforms for jumping. With summer temperatures topping 90 degrees, the 60-degree water is a refreshing way to cool off. And if you’re looking for a little more relaxation, head upstream for a more secluded place to soak in the scenery. Vancouver Island, off of Canada’s Pacific coast, houses a secluded set of pools known as the Sooke Potholes. 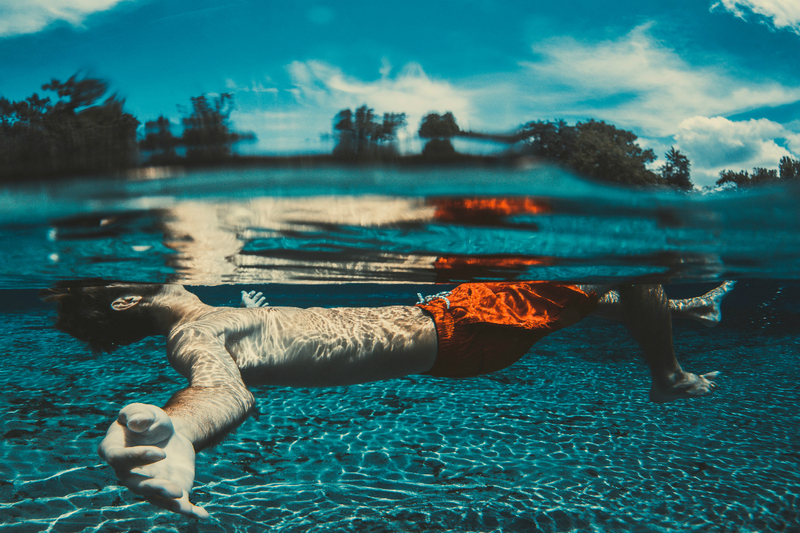 In an area known for foggy weather, summer temperatures can reach 75 degrees – just right for an outdoor swim. 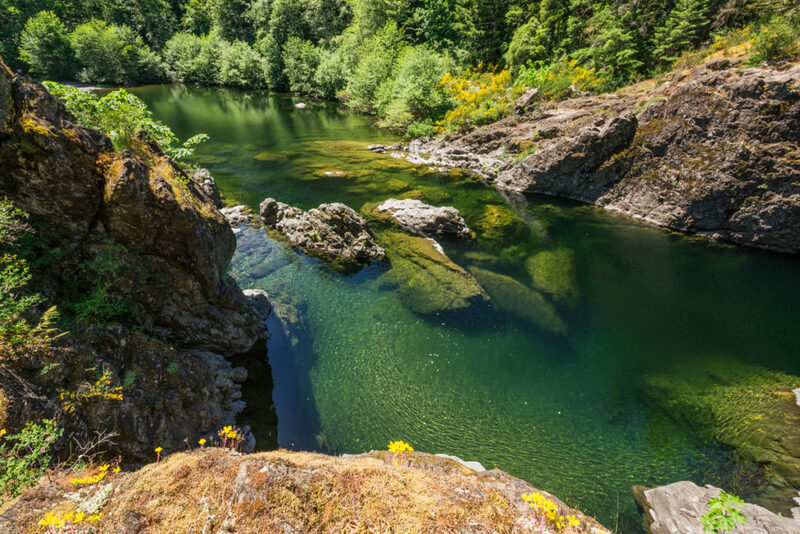 Swimmers must hike through a 136-acre park to reach the Potholes – a series of crags and craters created by fallen boulders in the Sooke River and connected by 6- to 10-foot-tall waterfalls. It’s like entering a moonscape in the middle of the forest. Visitors can swim in dozens of private pools, jump from the rocks or take a more adventurous dive from a 30-foot-tall cliff into the 13-foot-deep pool below – filled with brisk 44-degree water. Middle Quarters, a small village in one of Jamaica’s most sparsely populated regions, houses a pristine, action-packed swimming hole that is a favorite among locals – Y.S. Falls. Upon arrival, a local guide takes adventure seekers to a variety of waterfalls where countless opportunities for swimming and diving await! The fun begins at Tarzan Pool – a 50-foot-wide, 8-foot-deep pool with a rope swing that drops you into 70-degree water. After plunging a few more drops, take to the skies for more thrills and zig zag 40 feet above the waterfalls in a series of five zip lines. And with special permission, visitors can access a private waterfall at the top of the mountain that’s dotted with caves for more water-filled exploration. “Top Secret Swimming Holes” is part of Travel Channel’s “Dive In” programming event, delivering the ultimate summer getaway with heart-pumping water thrills, gorgeous secluded beach destinations and over-the-top waterslides. Check out TravelChannel.com for extra summer-themed content. Plus, join the conversation via @TravelChannel’s Instagram, Facebook, Twitter and Pinterest. Share your summer travel photos with #LiveTravelChannel for a chance to be featured on Travel Channel’s Instagram and other social platforms! For virtual and active travelers who want to go on a thrilling quest; taste other cultures; enjoy the mystery of the unexplored; get a dose of epic adventure or a splash of wacky fun; there is no better daily escape than Travel Channel. Reaching more than 83 million U.S. cable homes, Travel Channel is the world’s leading travel media brand. Fans also can visit Travel Channel for more information or interact with other fans through Facebook, Twitter, Pinterest and Instagram. Headquartered in Knoxville, Tenn., Travel Channel is owned by Scripps Networks Interactive, Inc., which also owns and operates HGTV, DIY Network, Food Network, Cooking Channel and Great American Country.